This is a review for KOIOS and is to be used to help customers decide if this is the right product for them. According to the manufacturer, this supplement has the ability to heighten your brain activity while giving you all-day mental clarity and energy. They also claim you will experience an increase in cognitive function and memory recall. Continue reading to find out more information on this supplement. For the best possible results you need to take this supplement on an empty stomach or after your workout. The serving size for this supplement is 2 capsules. If you are a smaller individual, you may want to decrease it to one capsule. You can also take with a cup of coffee if you prefer an ultimate boost. There are several different package options for this product. You can purchase one bottle for $49.95. If you prefer to purchase two at a time, you can do so for just $85.00. You can also purchase a 3-month supply of this supplement for $120.95. When taking this supplement I noticed a big boost of energy throughout the day. I took this in the morning with my breakfast and felt energetic all day. I am a smaller person so I had to cut down to one tablet and it was more effective that way. You will notice a boost of energy within 30 minutes of consuming this product. Many consumer reviews stated that this supplement is great to take right before a work out and has very few side effects. If you have a low tolerance for caffeine you should not take this product. There are some individuals who experienced the jitters when taking two capsules of this product, which is the recommended dose. If you are pregnant or nursing you should not take this supplement. If you are taking other medications you should consult your doctor before taking this product. It is important that you test out your level of tolerance for this product before you consume regularly. If taken on an empty stomach in can cause nausea and stomach cramping. The manufacturer offers a 110% money back guarantee on this product if it is returned within 30 days of purchase. 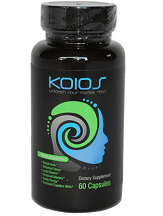 KOIOS seems like an effective supplement that can help boost energy before a workout. There is a 30-day 110% money back guarantee which allows consumers to try before they buy. There are many purchase options available for this product. This product does contain a lot of caffeine which could cause problems for individuals who have a low tolerance. There are many restrictions when it comes to this supplement and medication can be interfered with if not confirmed with a doctor beforehand. When this is taken on an empty stomach and it can also cause severe stomach pain.